Employs cooled exhaust gas recirculation (EGR), easily maintained exhaust filters, and selective catalytic reduction (SCR). Conserve power and fuel with engine, hydraulic, transmission, and service-brake coolers that run only when necessary. Reversible hydraulic-drive fan option back-blows cooler cores minimizing manual cleaning. Condition-based ash-service intervals for the diesel particulate filter notify operators before service is required. Optional onboard weighing system displays the payload while loading and even illuminates mirror-mounted load lights to alert the operator and job superintendent when the ADT is nearing capacity. Load tonnage is also accessible through JDLink™, so you can monitor productivity from virtually anywhere. The system has been factory calibrated to two-percent accuracy when payload exceeds 50 percent. Sealed and pressurized cab keeps out dust and noise. Larger entryway allows for easier ingress and egress. Adjustable air-ride seat provides maximum comfort. Filters, diagnostic ports and hydraulic oil reservoir are easy to access. An industry-leading feature, Deere machines can be checked and serviced daily from the ground, eliminating the need for tie-offs. This is a big advantage on MSHA regulated sites. Standard tire pressure/temperature-monitoring system helps maximum tire life and fuel efficiency. A passive alarm appears on monitor if pressure drops by 10 percent. Traction-boosting auto-diff lock engages and disengages as necessary, simplifying operation. Or it can be engaged on-the-fly if slipping is occurring. Safety features include autohorn, industry-leading transmission retarding, and braking performance for steep grade control. Easy-to-activate cab tilt doubles as a remote park-brake release (optional). All-new mirror mounting increases visibility, reduces vibration, and allows walk-through access to the engine compartment. 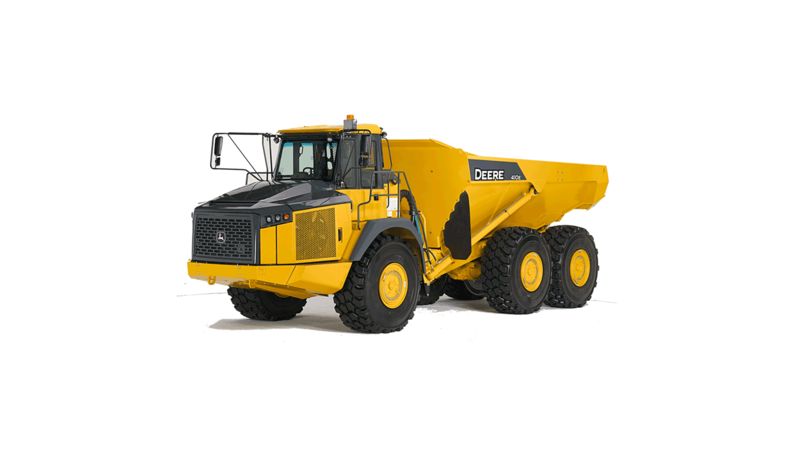 High-alloy-steel dump body and chassis deliver superior strength and rigidity without adding weight.